Will Alec Baldwin’s Donald Trump impression be huuuuge on Broadway? On a December 11 interview on The Howard Stern Show, the stage vet said he's mulling the opportunity to turn his book You Can’t Spell America Without Me into a solo show, similar to Will Farrell's 2009 Tony-nominated hit You’re Welcome, America. A Final Night with George W. Bush. You Can't Spell America Without Me, co-written by Baldwin and Kurt Andersen, is a parody that imagines the "really tremendous inside story" of Trump’s first year as president. It includes chapters like "I Need a TV in the Oval" and "The Bad Polls Are Probably Mostly or Completely Fake." Baldwin said the stage show would be produced by Saturday Night Live honcho Lorne Michaels, who is also bringing Tina Fey's Mean Girls to Broadway in 2018. 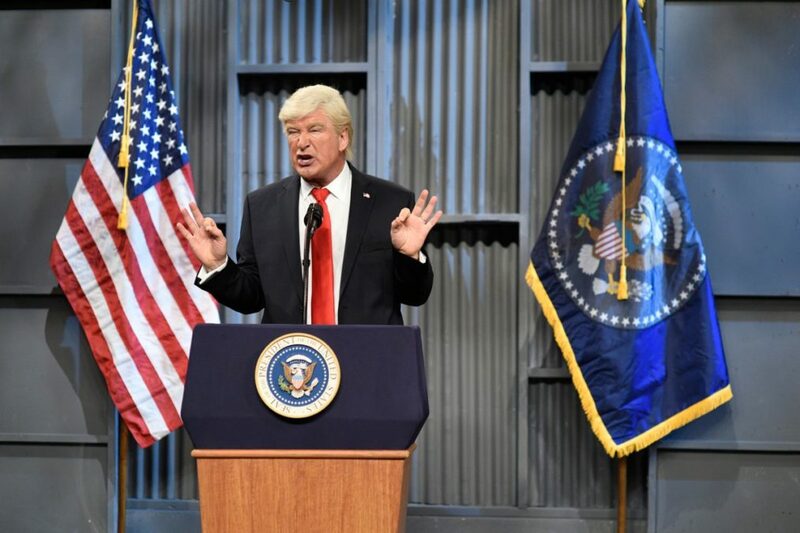 Baldwin has been playing Trump on SNL since September 2016, winning a 2017 Emmy Award for his work as Trump. Baldwin received a Tony Award nomination for playing Stanley Kowalski in A Streetcar Named Desire opposite Jessica Lange in 1992. His other Broadway credits include Loot, Serious Money, Twentieth Century and Orphans.